Posts which prompt users to “Tag a friend who likes to nap!” seem popular because they game Facebook’s algorithms, which causes Facebook to prioritize those posts in more News Feeds. bait” posts. Posts that goad users into taking actions like sharing, tagging, liking, or commenting. The company says posts that ask people for help, advice, or recommendations like raising money for charity or asking for travel advice won’t be affected by the update. 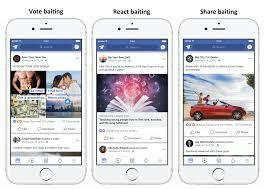 The internet giant reviewed and categorized hundreds of thousands of posts and taught a machine learning model to detect the different types of engagement bait. The company says it will implement stricter demotions for Pages that repeatedly bait engagement in a few weeks to give publishers time to adapt. “significant drops” in reach. They regularly tweaks its News Feed algorithm to reduce click bait and to target video spam, junk posts, and fake likes.